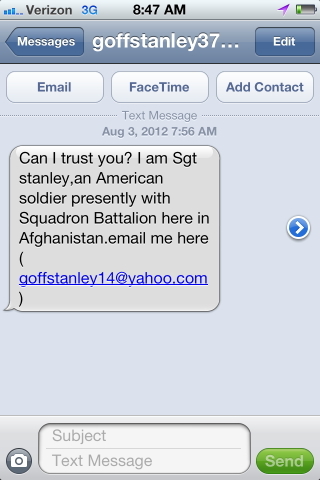 Just got this text message (presumably e-mailed to my global Verizon SMS 'e-mail' address) and when I googled the "Sergeant Stanley" name used in the text of the scam message your site came up w/ a list of names and scam e-mails similar to what I received. I took a screenshot of the text message (see attached) since I thought it may be of interest. I get these from time to time since they're the only medium where they don't pass through a traditional spam filter.